This was written with Excel 2010 in mind, but will work in 2007-2013. Version differences are pointed out where applicable. Screenshots are using 2010. As far as table structures go, that’s really it, there’s only three parts. Formatting, on the other hand, has quite a few more options. On the Table Tools | Design (tab) | Table Style Options (group), there are six options. * Only the first two are for table parts, the other four are formatting options. 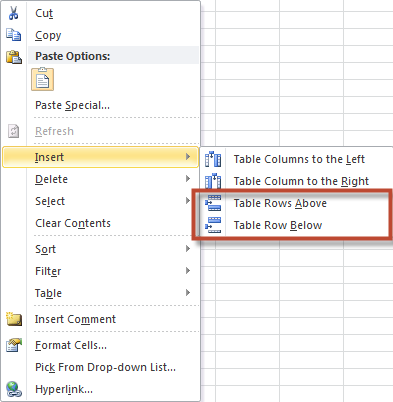 * In Excel 2013 there was an additional option added to this to toggle the filter buttons of a table header range. You’ll notice there are “Debug.Print” commands in the code, which print to your Immediate window (Ctrl + G). 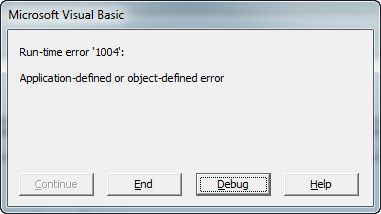 This is because if that table part can’t be shown, an error will be raised. This is due to the way tables are designed and how these table object parts show/hide. The VBA objects become Nothing when visibility is toggled off, so it’s an easy test there. But what actually happens on a worksheet is basically an Insert command for that range of cells, which spans only the width of the table. This presents a problem if you have data ranges below the table which are a different dimension or configuration. Most notably are 1) other tables, 2) merged cells, 3) an XML mapping, 4) query table, or 5) a PivotTable. In the picture below, there is a set of merged cells directly underneath the table. Currently it does not have its totals row showing. That is because of the merged cells, and Excel doesn’t want to make assumptions that, if by inserting cells in column B only (the total span of the table columns) it would insert rows going down, it’s ok to break your merged cells. …in the same example (with merged cells directly below your table range), you will get the option as seen below. By clicking OK to this message your merged cells will become unmerged and column B will have a cell inserted at B5, thus un-merging your cells below. ‘/// Purpose: Returns the range address of the specified table’s data body range. ‘/// Purpose: Returns the range address of the specified table’s header row range. ‘/// Purpose: Returns the range address of the specified table’s totals row range. You can obviously tell it is referring to a table range because of the structured table reference. This was accomplished by clicking on the header of the table when entering the formula. If you type in the range manually, it may not be so obvious. The above formula will yield the same results (same sample table as shown before). If you have a formula which references a table object, for example the header range, and you uncheck Header Row from the Table Style Options group, you will raise an error. You’ll see this no matter how you reference the header, either structured table references or standard cell referencing (or even R1C1 referencing style). These functions are almost identical to the range functions above, with the only difference that you must pass a cell reference instead of a table (ListObject) reference. In all three of these functions, if there is no table, the function will return the #VALUE! error. Likewise, if that object part of the table is non-existent, it will again return the #VALUE! error. Below are examples of all three functions in action. See how it works. I hope this has been helpful and this information comes in handy. But I don’t know how to get the name of the column (if it’s possible). Thanks for the backup. Your code works great! Using the HeaderRowRange, which, if the user isn’t showing, could be Nothing. You’re more likely to use the DataBodyRange, as it’s less likely to have all its cell deleted as opposed to the header disabled/hidden.